Service Provider of a wide range of services which include look walker. 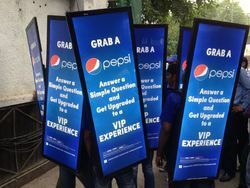 This lookwalkers (Lookwalker, Ad Walker, Human Banner, Walking Billboard) is a Mobile Advertising format. It is a kind of Walking billboard. In this kind of advertisement, person carries a Lookwalker billboard on his back and then moves in the market. Also, this billboard glows using a battery. This leaves an everlasting impression on the customers. This kind of innovative advertisement has the HIGHEST RECALL RATE OF THE BRAND and that's what the real purpose of advertisement and innovation is. This being an innovative marketing solution aids in attracting and engaging target audiences. We can handle activations in Pune, Mumbai, Delhi, Gurgaon, Noida, Chandigarh, Bangalore. Looking for Look Walker Advertisement ?